Have you read The Hunger Games trilogy? I have to say, I resisted it for a long time...I didn't think it was my "type" of book. Finally, I gave in and decided to give them a shot. Two weeks later, I'd read all three! Although I wouldn't say they are the best books ever, they definitely engage the reader. They're brutal but addicting stories with fascinating characters. Without giving anything away, I will say I was satisfied with the ending of the series...something I'd been worrying about throughout all three books after hearing several people say they were disappointed with the ending. What does that have to do with this recipe? This is what I had on the menu the evening I was 50 pages from finishing the third book. We picked up a rotisserie chicken from the grocery store on the way home and I begged Ryan to go in and pick it out because I didn't want to put the book down. Once home, my hunger won out and I was forced to stop reading to put this meal together. Thankfully, this was a breeze to make. Since I'd roasted the spaghetti squash the night before (and just reheated in the microwave), the rest of the dish came together quickly and easily, leaving plenty of time to finish the book before I had to clean the kitchen! I modified the original recipe slightly, adding asparagus in addition to the broccoli and adding protein in the form of chicken. 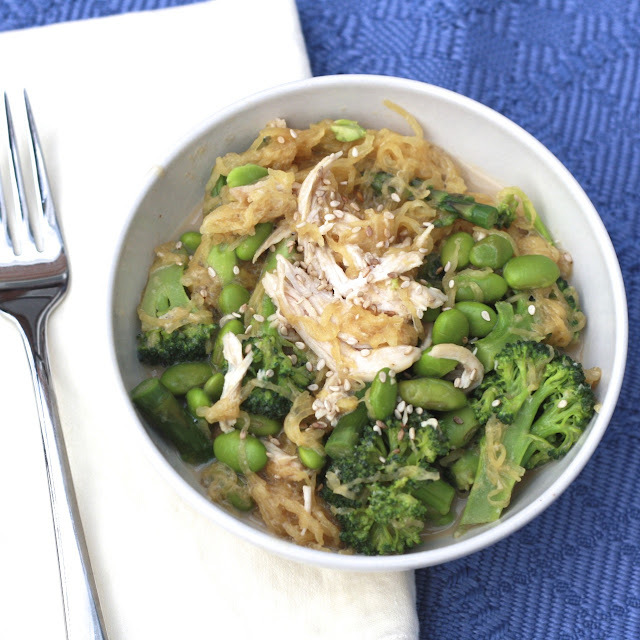 We loved this--the spaghetti squash did a great job of soaking up the delectable Asian-flavored sauce! Thoughts on The Hunger Games?! Who's going to see the movie in a few weeks? I'm excited to see how they bring the story to the big screen! 1. Preheat oven to 400F. Line a baking sheet with aluminum foil. Cut squash in half and place, cut side down, on prepared baking sheet. Roast for 30-40 minutes, until tender. When done, allow to cool for 5 minutes before using a fork to scrape inside of squash. Place strands in a bowl. 2. While the squash is cooking, whisk all of the sauce ingredients together in a bowl until combined. 3. Cook edamame according to package instructions. While edamame is cooking, steam broccoli and asparagus in the microwave. 4. 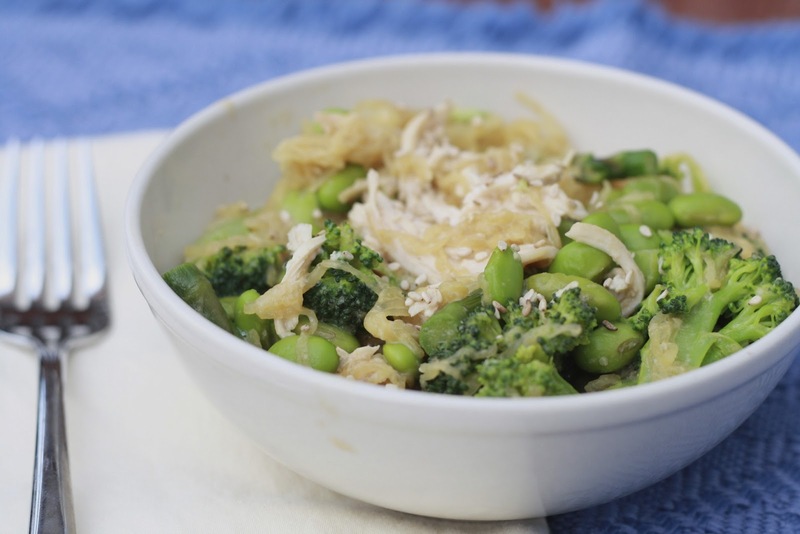 Toss together squash, broccoli, asparagus, edamame, chicken, and sauce. Sprinkle with sesame seeds and serve warm.